a warning sign (boomerangs as Indigenous elements). Yes, I thought about it, but it would have been a tacky overkill. I refrained. Prime Minister Malcolm Turnbull says the revamp of Sydney's historical Port Botany site, the place of the first encounter between Europeans and Indigenous Australians, will allow the country to "celebrate, understand and interpret" the "momentous place" it is. The plan, revealed today, will see the Kamay Botany Bay National Park transformed to include a $3 million "aquatic monument" of Captain James Cook, a museum, visitors centre and ferry wharves. Speaking after launching the $50 million plan, Mr Turnbull said the redevelopment would recognise the "potent" place Port Botany was. "It was a momentous occasion in our history," Mr Turnbull said after a tour of the site today. "And this is a momentous place, one we need to celebrate understand interpret and reflect on. "One that has to be deeply understood and reflected and interpreted with wisdom and with empathy. Please, PM Trumble, leave the dusty glory (or the glorious dust) of history where it is... Trying to polish it with modernity and empathy is fraught with symbolic colonoscopy — did I say colonoscopy? I meant "colonial-oscopy'. If the place needs a bit of rapid cement to plug a few holes between the old stones of the cairn marking the spot, so be it — but nothing else. 100 bux with labour included. And mow the lawn around it from time to time. A word ‘Boo-mer-rit,’ used by Indigenous people of Sydney to describe the ‘Scimiter’ (or scimitar - sword with curved blade) was recorded first in 1790. Captain David Collins, an officer of the First Fleet, recorded the similar word, ‘Wo-mur-rang’ in his diary in 1798 as the name of one of the Aboriginal clubs . The word boomerang probably entered the English vocabulary in the early 1800s when proper boomerangs appeared in the Sydney region. It appears that the boomerang as a toy, souvenir or symbol obscured its major original role as a hunting weapon. Over the years its original purpose has become increasingly distorted. Most of us still tend to see the boomerang as an ‘ethnological curiosity’ - a brilliant yet needless invention of the indigenous mind, mostly seen as a toy and an icon. In his popular book, ‘Triumph of the Nomads’, Professor Geoffrey Blainey dismisses the boomerang as an insignificant hunting implement. Benjamin Ruhe, in his 1977 book ‘Many Happy Returns’, goes even further, asserting that the boomerang could have never been a hunting weapon. The boomerang has made a long journey from the hands of Aboriginal hunters to national iconography. During this voyage its history has become distorted. Those who witnessed Aboriginal cultures in the early colonial times left us different accounts. For example, the marine explorer Phillip Parker King observed in 1818 that a boomerang ‘is used by the natives with success in killing the kangaroo.’ Indigenous people throw the boomerang ‘making it revolve on itself, and with such a velocity that one cannot see it ... only the whizzing of it is heard’ reported Francis Barrallier in 1802. An average hunting boomerang of about 500 grams looks like a thin soaring edge in flight, ‘but where it strikes, it breaks through with excessive impetus.’ It is an effective missile within a range of 200 metres. This is nearly three times the range of a hand-thrown spear. In experienced hands the boomerang can be a deadly weapon. The boomerang - as a hunting weapon - helps us expose some universal aspects of distant human history which, before agriculture, were shared widely across the world. To say that "the monument will be “quite lovely” and will include Indigenous elements" is the greatest insult in regard to remembering history. We all know (may be we don't, but we should) the controversy about the statues of the Confederate Generals in the USA and of the graffiti on the Captain Cook statue in Hyde Park, Sydney... 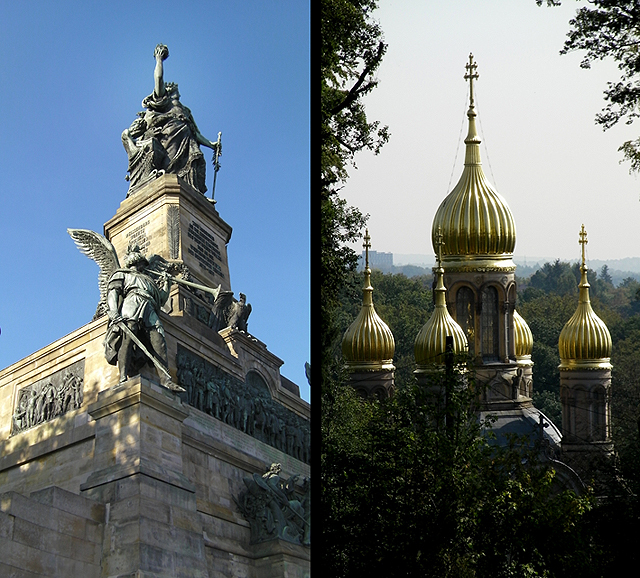 Imagine that this imposing monument to the Kaiser had been built in the middle of Paris, France, after his victory over Napoleon III !. And with the stones of the Arc de Triomphe to boot... It would have been demolished pronto by end of 1918. It's a bit like cartoonists always defacing (virtually — of course) the Statue of Liberty, NY, which the mad politicians in Washington pray to, after having pissed on it. AM I THE ONLY MAD LUNATIC OPPOSED TO THE "REVAMPING" OF COOK'S KURNELL SITE???? The South Australian premier, Steven Marshall, has “paused” treaty negotiations with Aboriginal groups, saying he has “other priorities” in Indigenous affairs. Marshall, who holds the Aboriginal affairs portfolio, told the ABC his government would focus on “practical outcomes” over “symbolic action”. It is the first confirmation of Marshall’s plans for the treaty process since his party won government last month. He was dismissive of the process in opposition, calling it a “cruel hoax”, but said this week that he would not make a final decision about whether to abandon it all together until he had seen a report from the SA treaty commissioner, Roger Thomas. 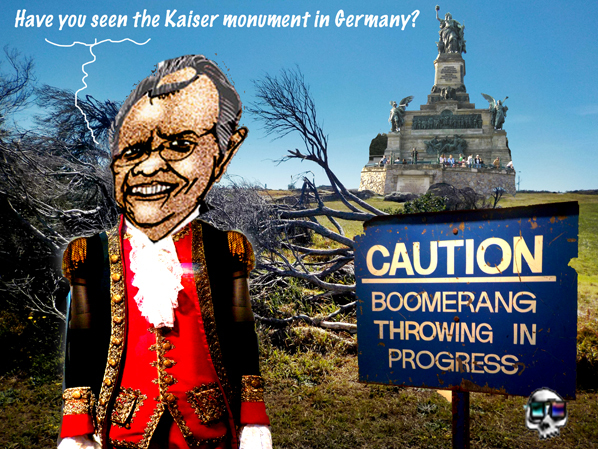 He will probably erect a “quite lovely monument that will include Indigenous elements" dedicated to the god of coal and petroleum. More than a century ago, when in Australia it was still widely presumed that Aboriginal people were a dying race, Ernest Renan was grappling with the question, what is a nation? It remains one of the most profound and powerful statements of identity, written in 1882 in the shadows of the French Revolution. There are calls for a process of truth and justice, to end what great Australian anthropologist William Stanner once called "The Great Australian Silence". In many ways, we have pierced that silence. New histories are being written rescuing the Indigenous story from the margins. We are confronting critical questions. How does our nation commemorate figures like Captain Cook? How should we remember the frontier wars? Was this continent settled or invaded? Most critically, how do we have this vital national discussion without tearing each other apart? How do we make this story — all if it — our story? How do we build a nation out of the pieces of the past? Ernest Renan speaks powerfully to us; forgetting is crucial to nation building, yet forgetting can too easily slip into denial. This year the theme of Reconciliation Week is "don't make history a mystery"; history can tell us who we are but history can also become a battlefield. Reconciliation is about nation building. In the words of Ernest Renan: "Man is a slave neither of his race, his language, his religion, the course of his rivers, nor the direction of his mountain ranges. "A great aggregation of men, in sane mind and warm heart, created a moral conscience that calls itself a nation." Matter of Fact with Stan Grant is on the ABC News Channel at 9pm, Monday to Thursday. Calling upon Renan's views is fraught with pitfalls, but the intent to stir our illusions of happy sky and sunny Australian beaches by shaking the torpor of history by Stan Grant is valid. I must say that during all his complicated life, Renan battled his own religious upbringing, nearly becoming a priest, half-adopted the scientific method, fought the Jews and Christianity, pitted his republicanism against his wife's royal beliefs, and was prepared to join the Empire of Napoleon III when the Germans, whose philosophy he loved through Hegel and other German philosophers, invaded "his" country. From a "mixed regional origin" himself, he also had to deal with the French folks from Bordeaux and those of Brittany. To the French people, in those days, this would be equivalent to Poms having to deal with the Irish. Renan's important philosophical internal contradiction helped him make some hefty decision, including declaring that Jesus was not god, and that Christianity was superior to the Jewish people. Thus he attracted brickbats from everywhere. He was a defender of people's self-determination concept, but on the other hand was in fact convinced of a "racial hierarchy of peoples" that he said was "established". Discursively, he subordinated the principle of self-determination of peoples to a racial hierarchy, i.e. he supported the colonialist expansion and the racist view of the Third Republic because he believed the French to be hierarchically superior (in a racial matter) to the African nations. We tend to still carry the same feelings, as Renan did, these days towards Israel, Feelings that are not anti-semitic, but trying to counter-balance the strong anti-Arabic stance taken by Israel. All of us, "Jews, Arab and Aryan alike", fearing a cultural flux that disturbs our own mixed bag of ancestry. In the days of Renan, though phrenology had been discredited, there were still some people, such as Cesare Lombroso, pushing the concept through. Renan also pushed the concept that the Ashkenazi Jews were actually Aryans, converted to the Jewish religion and culture, who spread throughout Europe. Back home, we need to stop "the great Australian silence" and find a solution to the Aboriginal "problem". Unearthing real history is a start and cultivating a proper social acceptance should go beyond apologies. The "white men" have to do the greatest journey in this realisation. This is why the Cook Monument Project — with "sensitive" tokenistic artefacts — is going in the wrong direction and should be condemned. If you really want a statue of Cook, let's have next to him, same size, an Aboriginal person standing proud. This of course would be historically inaccurate but that's what statues are: symbols of nations. But then the feminists and some minor groups might object... I meant evolved nations. Just a thought. The Australian Medical Association (AMA) is vowing to push for Indigenous constitutional change after endorsing the Uluru Statement. The powerful doctors lobby declared it would get on the "front foot" during any referendum campaign, raising the prospect of "yes" materials appearing in GPs' surgeries across the nation. "It was a fairly clear-cut decision for us to make," newly-installed AMA president Tony Bartone told the ABC. Hundreds of delegates at Uluru last May called for a permanent Indigenous advisory body to be enshrined in the constitution. The gathering summit, which followed six-months of consultations, also proposed a Makarrata Commission to oversee a truth-telling process and treaties with First Nations groups. "They're fairly fundamental aspirations that are part of the Uluru Statement," Dr Bartone said. "We can't really seek to close the gap when it come to health outcomes until we address the fundamental building blocks." He said the Uluru plan could improve "the conditions in which people are born, grow, live, work and age", leading to better health outcomes. An example of a successful move to “expand” a monument is the Maitland Brown Memorial (“the Explorers’ Monument”) in Fremantle, Western Australia, whose original 1913 description of events it depicted “caused division due to its one-sided account, the viewpoint of the early European settlers”. In 1994, the United Nations Year of Indigenous Peoples, a “counter-memorial” in the form of a second plaque – acknowledging the right of Indigenous people to defend country and commemorating “all those Aboriginal people who died during the invasion of their country” was added by the local Indigenous community. The council points out monuments to frontier war are limited and localised, although there have been suggestions a memorial ought to be “sited with prominence in the nation’s capital between the War Memorial and Parliament House, to commemorate the Indigenous battles in a spatially and philosophically significant location”. We need more than a patch up and less "bigger monuments". Go away, Morrison. The proposal comes amid renewed debate over national celebrations being held on January 26, the date the First Fleet arrived at Sydney Cove. The Prime Minister rejected calls to move the date of Australia Day, and instead suggested it would be good to "chat with the Australian people" about the concept of a new public holiday. "There's a lot to celebrate … and I think we can celebrate the fact that this is the world's oldest living culture," Mr Morrison said. "We don't have to pull Australia Day down to actually recognise the achievements of Indigenous Australia, the oldest living culture in the world; the two can coexist," Mr Morrison told Channel Seven. Government frontbencher Ken Wyatt, an Aboriginal man from Western Australia, described the idea of an Indigenous day as "a great step forward" and suggested holding the event during NAIDOC Week in July. "This is something I'd raised previously with a former prime minister," he said. "NAIDOC Week has been a great week in Australian society." Mr Wyatt said Australia Day should be left on January 26 because the day was "not about the settlement of this country anymore". "It is about us as a nation, us as a people, and the melting pot of a society that is working closely to build this nation," he said. Special Envoy for Indigenous Affairs Tony Abbott withheld judgment on the proposal. "Because we've already got things like NAIDOC week and national Sorry Day and so on," Mr Abbott told Sydney radio station 2GB. But he congratulated Mr Morrison for his "attack on those leftie, greenie, guilt-ridden councils that somehow think Australia Day is a day of shame, rather than a day of pride". This prosperity was not due to the sheep's back but to the way the land was stolen. Simple. Archaeologists have discovered hundreds of paramilitary Native Mounted Police camps across Queensland, shedding light on Australia's violent frontier history. Professor Bryce Barker, an archaeological anthropologist from the University of Southern Queensland, is one of the leaders of a research project investigating the evidence of Native Mounted Police life. "Anyone who works with Aboriginal communities in Queensland knows that nearly every Aboriginal community has a massacre narrative," Professor Barker said. A regional council in WA will allow new citizens to don their board shorts and thongs, despite the Prime Minister's move to introduce a formal dress code to citizenship ceremonies. The mayor of the City of Greater Geraldton, Shane Van Styn, has started a petition fighting Scott Morrison's move to ban singlets and thongs at the official ceremony. "Prime Minister Scott Morrison has got to get fair dinkum about this," he said. "Not every Australia Day ceremony is held in Parliament House or in some fancy dining hall in Sydney." "Here in Geraldton, our ceremony is done down on the beach in between sets of music on our wonderful family foreshore in about 40 degree heat. "If old mate new citizen wants to chuck on a pair of pluggers and celebrate all things Australian, then he should be able to do that." He said he would not be enforcing any rules for dress at any of Geraldton's citizenship ceremonies. "This is not a big pompous ceremony," he said. "Whilst I am officiating Australia Day citizenship ceremonies, if you want to emblazon yourself in an Australian singlet or wear boardies cause you are joining in the fun, I will let you up on stage and gladly welcome you as a new Australian." 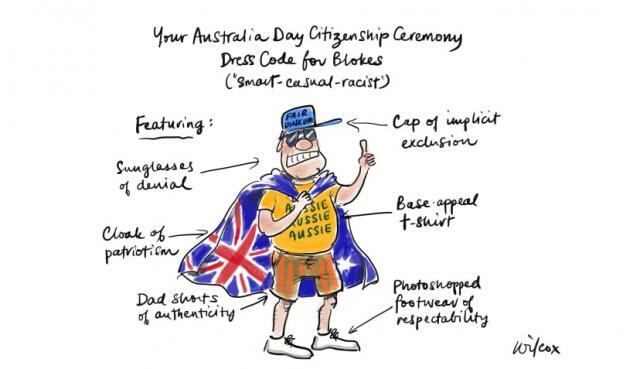 The dress code is part of the Federal Government's changes, slated to come into effect next year, to force local councils to hold citizenship ceremonies on Australia Day. Mr Morrison previously called on people to respect the dress code at official ceremonies and said it was fine to "put on the boardies and thongs afterward at the BBQ". The Australian Local Government Association would not comment on the dress code, but said the announcement to for councils to hold ceremonies on the 26th of January as a response to the change-the-date movement was "heavy-handed and odd". In a statement, ALGA President Mayor David O'Loughlin said most councils would not oppose the changes to the Australian Citizenship Ceremonies Code. "Most councils hold more than one citizenship ceremony a year, some as often as monthly," he said. "The Federal Government's strong focus on drawing a link between Australia Day and citizenship ceremonies is bizarre." And not to mention having to swear allegiance to the Noah's Ark Society... Scummo is an idiot.